Buy online EasyMat 120 sq. ft. 4 ft. x 30 ft. x 0.47 in. Underlayment for Tile and Stone SGL12 and leave review or share with Your friends. 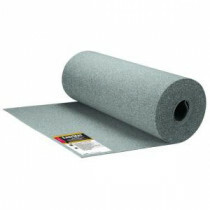 EasyMat is a versatile mat underlayment for setting tile and stone over any acceptable subfloor. EasyMat is so fast and easy to install because it is up to 25 times lighter than 1/4 in. (6 mm) backerboard, cuts easily with a utility knife, doesn't require any nails or screws and comes in a peel and stick version. The mat was specially designed so that the mortar locks in, creating a bonded crack-prevention system for subfloor movement up to 1/4 in. (6 mm).